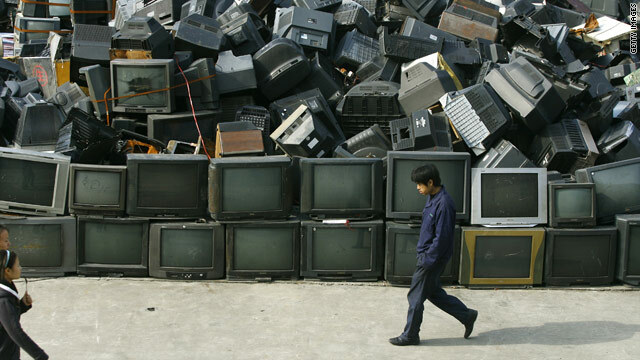 The dumpster may be the next place for your TV as viewers make the move to the internet. (The Frisky) -- How do I break this to you gently? If you are a Time Warner Cable subscriber, take a careful look at your next bill, because your fees went up as of New Year's Day. Fox, which is free for folks who get it via antennas, somehow managed to ink a new contract with the cable giant that includes fees for each subscriber. Meanwhile, Scripps Network -- which operates the Food Network and HGTV --tried to play the same game with Cablevision of New York City. But instead of caving, Cablevision decided to drop the channels altogether. Experts predict that this is the way things are going -- channels demanding more fees so they aren't so reliant on advertising, and cable companies having to choose between dropping channels and charging more. This is disconcerting because, hi, didn't these companies get the memo that you can find great television over the interwebs these days? Here are five places where the TV flows for free. 1. Go straight to the networks. ABC, the CW, MTV, VH1, and many others offer full episodes, almost as soon as a program airs, on their websites. And NBC offers current shows as well as classics like "Alfred Hitchcock Hour" and "The A-Team." The Frisky: Rihanna's new man, who is this guy? 2. Hulu has name recognition for a reason. The site brings together offerings from more than 190 content companies, meaning that you get current shows the morning after they air, plus loads of old shows, movies, documentaries, and web originals. 3. CastTV is well organized with shows and movies listed by title rather than genre. Find a show and click on it to see all available seasons and episodes. I've sneakily been keeping abreast of "Friday Night Lights" here since it's not airing on NBC for several more months while the season is already midway through on DirecTV. 4. Streamick doesn't look like much, but it's a site that allows you to live-stream 263 channels in real time, including NBC, BBC, ESPN, and Cartoon Network. The site eventually hopes to boost the number of available channels to 900. 5. TIOTI, an abbreviation of Tape It Off The Internet, is part television hub and part social networking site. You can watch your favorite TV shows and share episodes you like with friends. Plus, they have a section for entertainment news.